Government has passionately implored Zambians to work extra hard for them to contribute significantly to the economic development of their country. Vice President Inonge Wina said the Zambian population should be mobilised to work hard like what other countries are doing. Mrs. Wina told ZANIS in an interview in New Delhi today that Zambians must be innovative and committed to increasing the pace of national development. 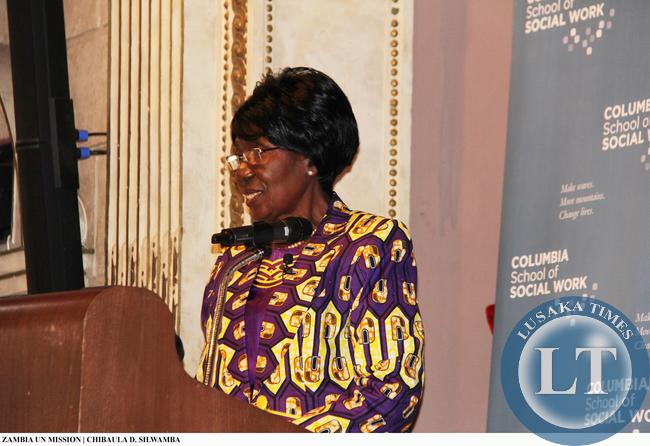 She said as part of the global community, Zambia should emulate and join other hardworking countries. “This world is transforming its governance issues especially in the economic sector and the population of Zambia needs to be mobilised to realise that development can only be achieved if Zambians work very hard, if Zambians are willing to accept innovative ideas on development,” she explained. The Vice President further pointed out that Zambia needs to collaborate with other countries in order to achieve the much sought for development. Mrs. Wina observed that the recently held India-Africa forum provided a platform for Zambia and other African countries to share ideas on how to accelerate their paces of development. She described the summit as beneficial adding that Zambia will implement the outcomes of the conference which was held on October 29, 2015 in New Delhi. She said Zambia will take advantage of India’s extension of an olive branch for African countries to acquire soft loans from the US$ 10 billion which that country offered for credit in the next five years. The Vice President said Zambia will utilise the finances which it may get from the concession credit to invest in areas such as energy, agriculture, health and other sectors where there is a deficit. During the summit, Prime Minister of India, Narendra Modi, announced that his country will offer concessional credit of US$10 billion to African countries over the next five years and provide US$ 600 million in grant assistance over the same period. been facing challenges in accessing loans for starting up or boosting their businesses in Zambia. She hoped the local financial lending institutions will relax their lending terms so that many Zambian private companies can have access to loans. The Vice President has since left New Delhi. Madame VP might sound a little more sincere if she was just as ambitious in condemning and eradicating corruption within government, civil service and police force of Zambia. One has to suspect that her government is either unwilling for obvious reasons to address the problems of corruption and bribery ot just completely inept in the business of management in all of its aspects. This grandma is completely out of touch this is what she should be telling the lazy bum in State House! !